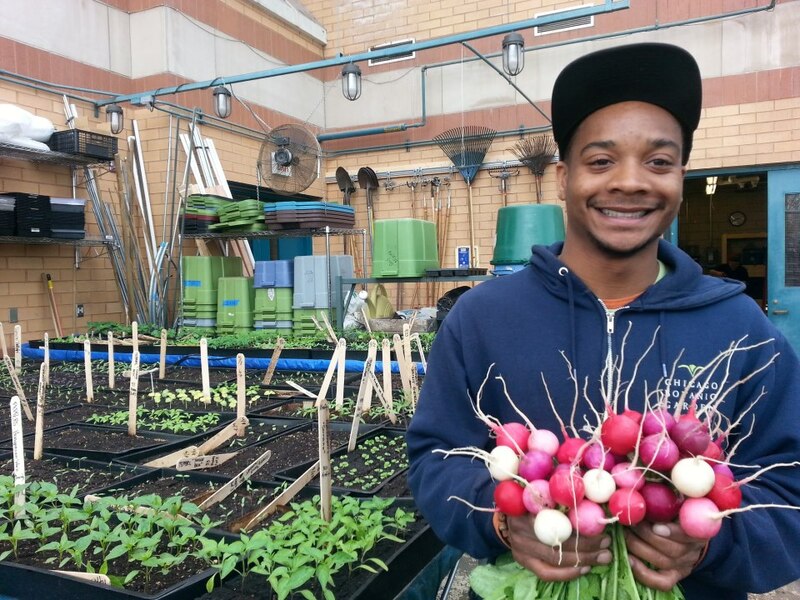 Darius Jones, 21, with easter egg radishes. 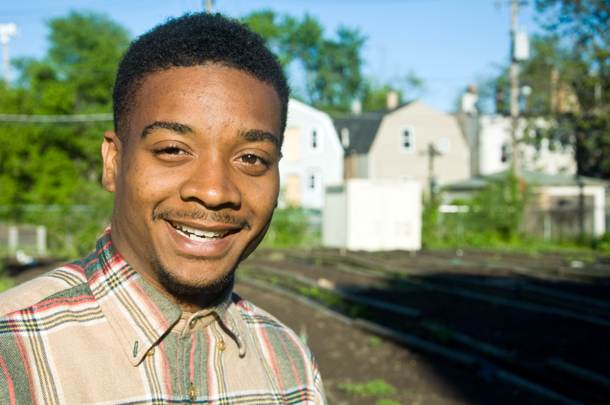 Raised in gritty West Garfield Park, Jones struggled to turn his life around, but recently launched his own urban agriculture business. Darius Jones, at the garden plot he shares on the 200 block of N. Kenneth Ave.
Darius Jones grew up slinging drugs in West Garfield Park, a few blocks and seemingly a lifetime away from the garden beds he now tends with the support of the United States Department of Agriculture. On May 1, the 21-year-old launched Urban Aggies, an incubator for urban agriculture enterprises that he hopes to parlay into a network of farms and small businesses. He is also part of a project administered by the Chicago Botanic Garden, and funded through a three-year USDA effort to rejuvenate food deserts on the city’s West and South Sides. But trading gang life for garden spades was no simple switch. Jones first worked the soil behind bars at the Vocational Rehabilitation Impact Center, or “Boot Camp” as it’s known. He was arrested for aggravated carjacking at 17, when he was a junior at Crane High School. He waited 15 months in Cook County prison before pleading guilty to a lesser offense, which earned him four months in Boot Camp. In the compound’s one-acre garden, he transplanted head lettuce, built raised beds and learned the basics of horticulture, landscaping and gardening. After more than a year in a maximum security facility, Jones said he was just happy to be outside. He served his time and took a job at a compost operation right next door to Boot Camp. But work is only eight hours each day. He quickly fell back in with his old crowd. He signed up for the Chicago Botanic Garden’s Windy City Harvest program, a nine month training course in sustainable urban horticulture and agriculture, run through Richard J. Daley College. During the program he interned as a manager for the program’s Pilsen market stand. Jones surprised himself by blurting out solutions to garden problems that he didn’t think he knew the answers to. But after work he returned to the same environment that landed many of his friends in jail or in the morgue. It took a brush with violence for his new life to take root. Jones got caught up in a series of gang disputes that one night found him sobbing on the shore of Lake Michigan, remembering the people he’d met in prison who were serving 60 year sentences. His life is different now. He lives with his girlfriend in Humboldt Park, and was recently promoted to sales coordinator at the farmers market. “It’s all about who you come home to,” he said. On an 1,800-square-foot lot in West Garfield Park, his is one of three incubator farms for Windy City Harvest’s urban agriculture initiative, which last month received $750,000 from USDA’s Beginning Farmers and Ranchers Development Program. He shares half of the growing space with a colleague who grows vegetables for her Smith Park food truck business. Five more beginning farmers on the South and West Sides will join the program over the next three years. Urban Aggies’ first harvest will fill sampler boxes with winterbor kale, carrots, beets, swiss chard and turnips, but Jones said he hopes to expand into value added products like jams and pickles. He hopes to sell his produce to Inspiration Café, a neighborhood restaurant that employs formerly incarcerated men and serves people struggling with homelessness and poverty. He said the far West Side is still gritty, but Jones is heartened by the support he has received since he turned away from his past. Several new farmers markets have cropped up in Jones&apos; neighborhood recently, a trend he said he would be proud to help continue.